At ABWA, we strongly believe in the holistic development of our entire family. Our students and teachers together strive to create a cohesive learning environment that is conducive to developing a child's innate talents. In addition to a focus on academic excellence, our students are encouraged to think critically and to question the world around them. Our dedicated teachers encouraged to improve their skills through the in-service training workshops conducted regularly throughout the year. 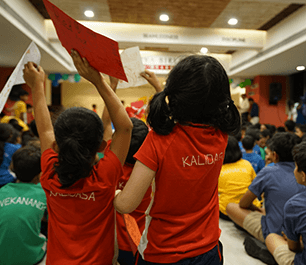 Further, through a wide range of extra and co-curricular activities, we aim to develop a child’s personality and stimulate them to be mindful, sensitive and responsible members of society. We focus on the socio-emotional development of every child to ensure that each and every child feels safe, supported and motivated. We believe that every child is unique and can achieve his/her true potential given a nurturing environment. Our teachers at ABWA have the child at the heart of their teaching and work with each child to achieve the best they can. Our aim, therefore is to make learning fun-filled and active , keeping in mind our rich Indian values and global contemporary trends. We ensure that education does not focus on rote learning, but also helps to develop all the skills necessary to face the world with confidence. Ralph Waldo Emerson, the American philosopher said, “Character is everything”. For a well-rounded personality, academic excellence is incomplete without character. 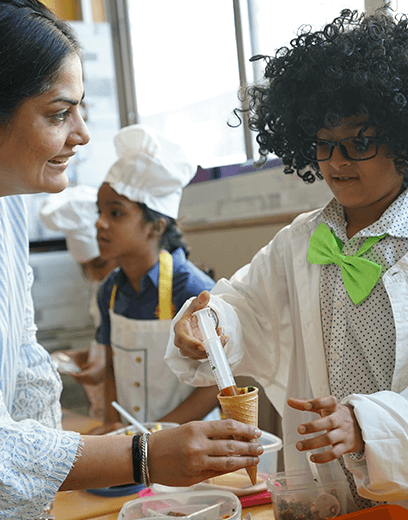 The philosophy of our school is to help every child become a balanced and responsible adult having imbibed the values that lie at the core of our ethos - integrity and empathy, passion and seamlessness as well as transparency and discipline. To nurture the innate potential of our students and mould them into passionate, committed, competent, sensitive, value-based individuals with leadership qualities.